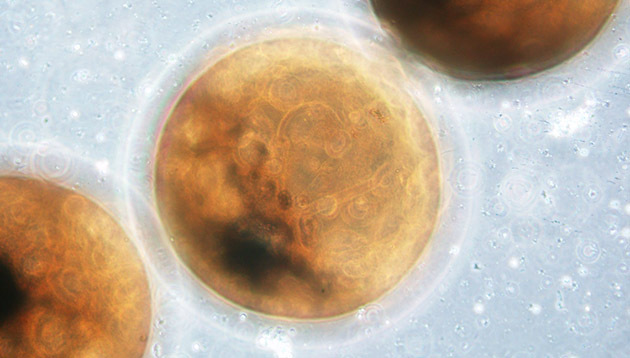 BIOS scientists gained a fresh perspective on six-month-old mustard coral larvae (shown in photo above) and tiny lionfish eggs (photo below) using a new microscope at the Institute. The inverted microscope, which arrived in March, has a light source above the stage, where the microscope slides are placed, and the lenses are below the stage; this is opposite from an upright, or conventional, microscope. This state-of-the-art microscope has the ability to enhance contrast in unstained and transparent samples. “An inverted microscope is especially useful for studying larger organisms like zooplankton and coral larvae and, as such, will benefit a range of scientific programs at BIOS,” said microbiologist Rachel Parsons, who oversees the Microscopy and Image Analysis Facility at BIOS. Coral reef ecologist Gretchen Goodbody-Gringley, who studies lionfish, an invasive and troublesome species on Bermuda’s reefs, said that she would like to use this imagery to estimate egg size and development. This will more accurately determine how rates of reproduction differ among marine habitats in Bermuda. Scientists examined the young coral, about the size of a pencil eraser, to learn about the variety of sizes of organisms that can be measured using the new microscope, said BIOS biologist Amy Maas, one of the authors on the National Science Foundation grant used to acquire the microscope. Under the microscope, the coral was subjected to different wavelengths of light, which show up as different colors in the photograph. 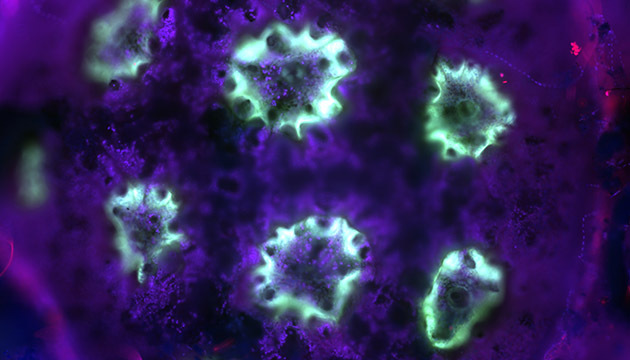 Each light source resulted in a different part of the coral fluorescing, including the coral’s skeleton in red, the tissue in purple, and, in light blue, algae that lives in tissue and contains naturally fluorescent pigments.